Since the devastation of Hurricanes Maria and Irma, Puerto Rico’s quest for statehood seems even more urgent. Several Republicans, as well as Democrats, in Congress support the move. Puerto Rico has copied Tennessee (in 1796) by sending a delegation of “senators and representatives” to Congress to agitate for statehood. Tennessee succeeded. Other states used unorthodox means, such as West Virginia, whose entry may have even been illegal. West Virginia was carved out of Virginia in 1862, without Virginia’s permission. The Constitution forbids a new state being carved out of the boundaries of an old one without the consent of that state’s legislature. Virginia had seceded in the Civil War, so did Virginia’s illegal act of seceding mean that Congress no longer needed its permission? Congress voted in the state of West Virginia in 1863. In 2017 Resident Commissioner Jenniffer González Colón filed an “admission bill” for statehood in the U.S. House of Representatives. Ironically, unless Puerto Rico becomes a state, it cannot actually introduce bills into Congress. It has only “non-voting delegates” who attend and observe but cannot vote. Is voting worth being taxed? What does the commissioner mean by full equality? Puerto Ricans may vote in presidential primaries but not in the actual election. That is, unless they move to the mainland. As American citizens by birth, if they reside in the fifty states, Puerto Ricans can apply for the vote. If they stay at home, they cannot. The logic of this system escapes them. Some (American-born retirees seeking tax havens?) might say that escaping federal income tax more than makes up for disenfranchisement. Demands for nationhood waxed and waned in Puerto Rico through most of the 20th century. But popular sentiment shifted toward statehood. Its economy is in crisis, infrastructure is crumbling, and jobs are scarce. Nearly half the island’s 3.5 million residents are poor. Its population is in despair as people go to the U.S. for jobs. Just last summer, Puerto Rico missed nearly a billion dollars in bond payments, forcing a congressional bailout. It now owes $18 billion in general obligation debt. 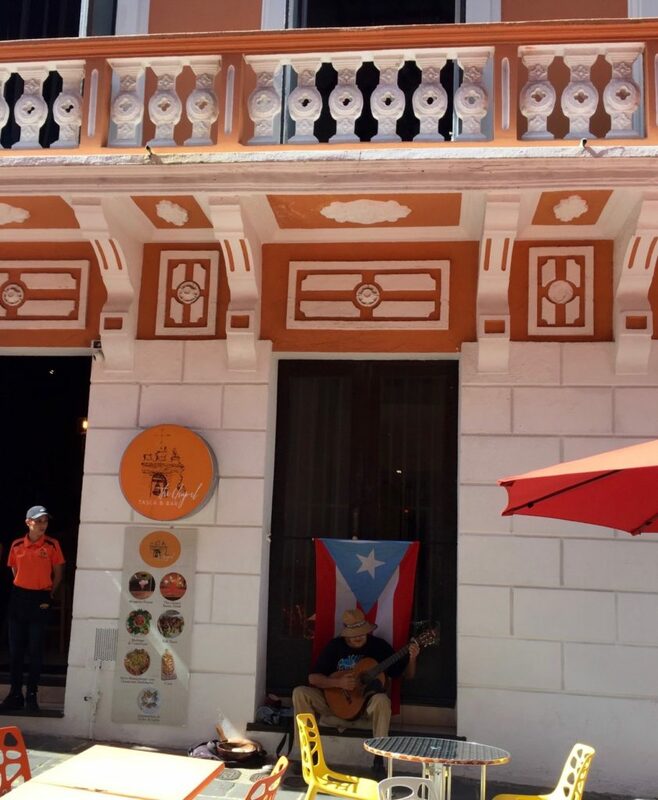 Puerto Rico, translated means “rich port,” and it has always been coveted for its capital, San Juan, the gateway to the New World in the 16th century. Spain moved in and built enormous fortifications. By 1800, Napoleon too had dreams of a new world empire, headquartered in the Caribbean. 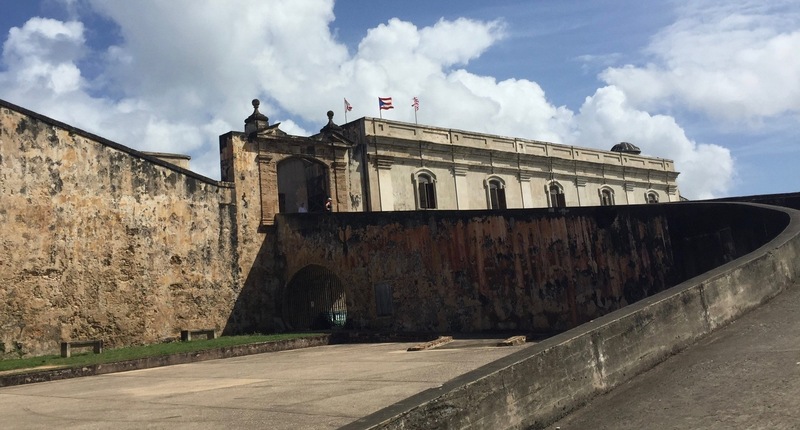 In Old San Juan, I visited centuries old Spanish forts (pictured), which overlook the harbor. Visitors now enjoy the sumptuous view from the parapets, but for centuries, Spanish soldiers peered outward to warn of advancing warships or even pirates. Other European powers always envied its strategic location, scheming to wrest it from Spain. But it was the Americans that succeeded 12 decades ago. In the Spanish American War of 1898, Teddy Roosevelt pried the island from Spain. Soon after, the island was made a federal territory. The Supreme Court later clarified its rights in the Insular Cases. Still strategically desirable because of proximity to the Panama Canal, Puerto Rico feels used by the U.S. Its people have fought in all our wars. We made it a territory but left to languish. With more help, Gonzalez and Gov. Ricardo Rosselló and other statehood supporters believe it could thrive. Should Puerto Rico join the family of states? Some Americans reject statehood on the grounds that Puerto Rico’s problems–debt, crime, poverty–would become America’s problems, while others point to benefits in trade and revenue. But prominent Florida politicians such as Marco Rubio and Rick Scott support statehood, arguing for mutual economic benefits. Opponents of statehood claim–with reason–that inheriting the island’s problems is something we just can’t afford. There is no mathematical formula to determine whether adding Puerto Rico would strengthen or weaken America as a whole. American citizens can only muster our best arguments and best facts, while taking the case to Congress, the sole body that can vote in a new state. History teaches that any worthy debate has truth, validity and compelling arguments on all sides. Did you find this article enlightening? If so, we hope you will share it. Peace and a happy new year to all.